The single best pundit of Israeli politics is, of course, Nahum Barnea of Yediot Acharonot. However, most of what he writes doesn't get put onto the Web, since his employers want people to buy their dead tree version, and even the articles that do find their way online more often than not don't get translated to English. Yossie Verter of Haaretz, however, is pretty good, and he's easy to find online in English since Haaretz has a different business model (an inferior one but that's not my subject). Yesterday Verter tried to explain what's going on in the negotiations towards forming a government. No one really knows, of course, but Verter's description rings true. The essence of it is that Bibi and Tzipi are playing poker. She wants a power-sharing government with a rotating prime minstership, Bibi the first two years, then she for the next two years. Bibi wants a government with Kadima, but intends to bring along some of his natural (or not-so-natural) allies; and he extremely definitely decidedly completely determinately isn't in favor of a rotating prime minstership. Their sticking point is a declaration of acceptance of partition and the two-state solution: Tzipi demands such a declaration, Bibi refuses. Their reasons are that Tzipi expects that such a declaration will frighten off Bibi's more lunatic allies, such as Ichud Leumi, the far-right settler party which has four MKs; once they're gone Bibi will have lost his block, and he'll have to offer her the parity she wants. His position is the mirror image of hers, with the addition that he really doesn't want that far-right coalition, but he expects that in a week or two parts of her own party will begin clamoring for government posts because otherwise they'll revert to being mere mortal MKs, heaven forbid. On the face of it, this is all pure spin, maneuvering and poker. After all, with the possible exception of Ehud Olmert, there is no individual in the entire state of Israel who knows better than Tzipi Livni that peace with the Palestinians is not in the cards for the time being. She and Olmert, after all, have spent much of the past 18 months or so dealing directly with the top two Fatah Palestinian leaders, the so-called moderates, Abu Mazen (Olmert) and Abu Ala (Livni). They talked and talked and talked, and no-one stopped them from reaching agreements, proclaiming peace, signing agreements, celebrating at the White House and getting Nobel Peace Prizes. I didn't stop them, and neither did you. The reason it didn't happen was that the distance between the positions of these moderate Israelis and moderate Palestinians are, at present, unbridegeable, and have to do with the Right of Return but also all sorts of other matters - and also, one might add, with the total inability of the Palestinian side to deliver, what with Hamas being actively hostile to the whole idea. So why are Tzipi and Bibi fighting over such a demonstrably non-issue? I can think of three explanations. The first is that one or both of them are idiots. This could be the case, of course, one should never over-estimate one's political leaders, and history is chock full of political and military leaders who in hindsight at least must have been fools. The second explanation is that one of them is bluffing, or perhaps even both, but no-one knows which of them (or both). In this scenario, one of them will blink, but not yet. The time for blinking will be during the last of the six weeks Bibi legally has to form a government. At that point, either he'll decide her version is better than the best he's managed to cobble together, or she'll decide what he originally offered is better than sitting in the opposition. Whichever of them blinks will, of course, have a rational explanation along the lines of "I've changed my mind for the Greater Good, Call of Duty" and so on. The third explanation is actually serious, and has to do with opposing appraisals of reality. The fact that both know no agreement can be reached with the Palestinians doesn't mean they agree with the implications. Bibi looks at the situation and figures it isn't time to clash with his natural allies nor with his (very old and idealistic) father, nor with his own preferences, and will say that since the Palestinians don't want peace on terms any electable Israeli can offer, screw them and let's do what is most convenient. Tzipi, on the other hand, says that in spite of there indeed not being any Palestinian with whom to make peace, it's important that we preserve the impression that we're willing to walk the extra mile only there's no peace at the end of it. This position assumes the Obama administration will put pressure on both sides as the Bosh administration didn't, and prefers to go along with the American demands so that even the Americans understand who's being reasonable and who isn't. This is called "intelligently managing the conflict", and I'm reasonably convinced Livni's tactic for doing so is better than Netanyahu's. But maybe that's just me. In the name of fairness: not long ago I posted an article criticizing the Obama administration for participating in the preparations for the Durban 2 hatefest. Yesterday the State Department announced that having tested the waters they'd decided not to plunge in, essentially continuing the policy formulated by the Bush administration of boycotting the conference. A number of European countries are mulling the same - after all, it's the Obama Americans who are boycotting the conference, not the Bush ones. All in all, the process seems reasonable. The new folks inherited a rather unusual position - America doesn't often boycott things - so they went to check what it was all about. Having learned first hand, they understood the inherited position was correct, and they affirmed it. Can't do better than that, it seems to me. Now and again the Gemara wanders off from its mostly legal discussions into legends, myths and stories. Aggadeta is the word for these excursions. Many talmudists rather dislike these detours for not being legalistic or practical; me, since I'm more of a historical mindset than a legalistic one, I think these sections are great fun. They give all sorts of fascinating insights into how life was lived, how it's still lived, and how it out to be lived. Everyone's heard the story of the man who had two wives, one young the other elderly, and how the young one weeded out his gray hairs while the elderly one weeded out the black hairs, until he was "bald from both sides" (keraiach mekan u-mikan). I don't know where the story originated, but you can find it in the Gemara, where it was recorded at least 1,600 years ago, at Bava Kamma 60b. But I mention that one for the anecdote. More interesting, further down the same page, is the story told by Rav Huna about a case where King David, warring with the Philistines, could only get at them by burning the fields in which they were hiding. He sent a question to the Sanhedrin (the high court in Jerusalem) asking if it is permissible to destroy property of non-combatants to save oneself. The Sanhedrin responded that as a general rule, one may not do so, but for the king it is permissible, because the King must forge a path for his army so as to face his enemies. More than a millennium before Hobbes. This thread began, and is explained, here. One of the frustrations of standing up to the liars about Israel is when they churn out statistics and facts (often, "statistics and facts") about how uniquely bad Israel is, and you absolutely know they're spouting nonsense, but you don't have counter facts at your fingertips, nor are you brazen enough simply to invent them (a tactic that actually does work, since your interlocutors generally don't know much about the world, but I'd advise against it none-the-less). So, since one of the points of this blog is to strengthen the resolve of our side, the following link is offered as a service to our public. It's an article from the Economist about the eagerness of many combatants in many wars to aim specifically at women and children. It isn't pleasant reading. On the contrary: I wouldn't recommend it all, if it weren't for the insight it gives about how wars are often waged in the early 21st century. And note that the article isn't about local cases of loss of control. It's about calculated tactics, some of them even strategies, purposefully articulated and generally cold-blooded in their execution. If international human rights organizations have any right to exist, it is to stop these evil practices. Since they are mostly powerless to do so, it's legitimate to cast doubt. Israel isn't doing any of this; as a matter of fact, in some 90 years of warfare, Israel has never done any of this. Michael Slackman has a troubling piece in today's New York Times. He's been wandering around Cairo, talking to regular Cairenes (nothing intrinsically wrong with that), trying to understand what the Obama Administration must do if they are really listening to the Arabs and wish to mend bridges to them. His answer, in a nutshell, is to abandon the American perspective on terrorism. According to the Arabs, terrorism is the word used by the Americans for what Arabs do, even though the real terrorists are the Americans themselves, and much worse than them, the Israelis. I have no doubt this is indeed what most Arabs feel - nay: fervently and devoutly believe. They also believe Jews murder non-Jewish children for their blood, for example. The antisemitism the Arab world is drenched in these days can only be compared to the worst version of the Nazi form of it in its severity. It makes the antisemitism of the Guardian look like a mild case of benign and harmless distaste. I'm not saying this for the hyperbole. The Arab world really and truly is awash in Nazi-like hatred of the Jews; a fact Michael Slackman is totally unaware of (or he's aware and willfully disregarding, or he's aware and uncaring - so let's assume he's merely an ignoramus). So his article is totally lacking in context, lacking in history, but most peculiarly, it's also lacking in moral fiber. His thesis is "Hey, these people think we're hypocrites, so we're going to have to bend over backwards to prove to them we're not, including changing how we see the world and behave in it, otherwise they won't like us!" Craven, silly, and of course dangerous. For the Americans, I mean. Oh, as Irving Howe said, "There is no heart so warm that it doesn't have a cold spot for the Jews." We like to think of hatred of the Jews as a low, base sentiment that is entertained by nasty, ignorant people, wallowing in their own hatefulness. But normally it's not like that. Hatred for the Jews has generally taken the form of a lofty sentiment, instead of a lowly one - a noble feeling embraced by people who believe they stand for the highest and most admirable of moral views. Unlike journalism, this one is by someone deeply immersed in historical context. The Guardian allows Uri Dromi - a former IDF spokesman - to present Israel's version of the use of various weapons in Gaza. By this stage of the story, this is no longer enough to exonerate the Guardian from the accusation of fomenting antisemitism and being antisemitic in their editorial line and ethos, though as I've said in the past, the Guardian is indeed better than the worst Jew haters in the Arab world: they live in a democracy and still go through the motions of allowing multiple voices. The readers of CiF, however, have no such compunctions. If you want to plumb the cesspool of Western Jew hatred, the comments at Comment is Free is a fine place to start. In the week or so I've been regularly visiting Glenn Greenwald's blog I've noticed he's a very wordy fellow. I'm one, too, but he far outstrips me. He also uses parenthesis in parenthesis, not a sign of a fine writer. Today he has posted on Israel, or actually, on the hope the Obama administration will put lots of pressure on, and distance itself from, Israel. Personally, I think if Israel ends up with a coalition dominated by our far right, Netanyahu will deserve a modicum of pressure, and for that matter, so will we, so as to force us to decide if settlements are important enough to face down our American friends over. But there are various "ifs" in that scenario. And either way, it has little to do with peace, since our war with the Palestinians isn't about settlements, of which there are none in Gaza. In the meantime, Greenwald's main thesis, it seems to me, is that the Obamaites must put lots of pressure on Israel; the Palestinians, if I read correctly, don't even get mentioned. The implication being that the lack of peace is mostly the fault of Israel, and marginally the fault of the Bush administration for allowing this. it's hard to believe that George Mitchell was willing to take on this assignment unless he has the authority to apply the pressure on Israel which is an absolute pre-requisite for any hope of success. For now, those who desire a serious change in U.S. policy towards Israel should welcome any signs -- even limited and preliminary ones -- that the U.S. is willing to forcefully and, when necessary, publicly oppose and condemn Israeli actions (as we do with all other foreign countries). This obituary for Alison Des Forges shows what a real human rights activist does, in the parts of the world that really need them. Binyam Mohamed is an Ethiopian fellow with a strange story. When in his teens he apparently entered the UK and requested asylum, was turned down, and stayed anyway. At some point he converted to Islam, and later on went to Pakistan and Afghanistan to see - if you wish to believe it - if the Taleban had managed in setting up a proper Islamic state. While there he engaged in something or other, perhaps joining an aid organization, perhaps recruiting in al-Qaida and being trained in ferociousness. It depends which version you choose to believe in, and I certainly can't say, not having been there at the time. By and by he was arrested boarding a plane to the UK with a false passport; this seems the last moment in the story all versions agree upon. He probably disappeared into a Moroccan interrogation center, where he says he was tortured - a credible tale in itself, given what is known about Moroccan police procedures: the last thing you'd want is to be treated to them. A year or two later he reached Guantanamo. So far as I can make out, the authorities there didn't have enough credible evidence to indict him, but nor could they set him free unless someone was willing to take him. Recently the British authorities have accepted him, and this week he was flown to London and set free, though he must come to a local police station regularly until the British authorities decide what to do with him. I am not asking for vengeance; only that the truth should be made known, so that nobody in the future should have to endure what I have endured. Thank you. Touching, isn't it. Eloquent, too. Christian-style noble, second-cheek-for-slapping sentiments, suffering so that humankind be redeemed. Almost exactly what you'd expect coming from a fellow with his story. Anyway. The London Times has been following the story, and trying, it seems, to be factual. David Aaronovitch is less convinced, and suggests the treatment of Mr Mohamed is hard to condone, but not without losing his ability to recognize the reality it's part of; a reality in which even worse things are happening. And then you have the Guardian. They offered Mr Mohamed to write an article about his thoughts, and his lawyers duly did so for him, as cited above. The whole issue has nothing to do with Israel or the Jews, so one might cite the cluelessness or the malice of the Guardian in this case as proof their general outlook is sick, but not antisemitic. It seems to me, however, as if the topics are connected, and together go part of the way towards creating a Weltanschauung, a totality of understanding the world which is broader than a mere ideology. In this Weltanschauung, the Islamists, their fellow travelers and anyone involved with them are thoughtful misunderstood and wronged souls; the power brokers in the West who confront them, meanwhile, are inexplicably evil, cruel, and generally reprehensible. Meanwhile, as part of my other, professional, life, today I came across the interesting tidbit of information that the British Library (not a British library: THE British Library) not long ago migrated its many systems into a single one, the Israeli-made Aleph system. (You can see the marketing propaganda here, if you insist). This means that each and every time one of the Guardian types uses their national library for whatever purpose, including online, they're benefiting from... oy, I don't even want to complete the sentence. Here's a an off-topic post; if you come here solely for the Guardian-bashing, feel free to skip it. The Economist tells about two reports about to be published in the UK dwelling gravely on the sorry state of schools. One, the product of a collaborative effort of lots of experts, suggests that perhaps school-children need be inculcated with knowledge. The other, written by a serial report writer who was carefully primed in advance, suggests that children be taught literacy, maths, and how to use Google. Lots of knowledge vs. knowing how to find stuff: guess which strategy is going to be adopted? Alongside that article is a quick annotated dictionary for the language spoken by the officials who deal with such matters. It's hilarious. Also, if I'm already in the business of recommending off-topic reading, there's an article in the NYT which suggests that scientists have their own political positions, just like everyone else, and their scientific utterings can be influenced by them, also just like with mortal humans. What a shattering thought. You might want to mark the date of the upcoming international hate fest: the so-called Durban 2 conference, scheduled for April 20th in Geneva. April 20th, as some people know, was Hitler's birthday, a national holiday in Nazi Germany, and a high-alert day for West German police forces after the war. The symbolism is apt. According to this rather technical article, the Obama Administration has broken with the Bush Administration's admirable stand of having nothing to do with the event. The Obama people are participating in the preparations, and aren't even trying very hard to head off the damage. I'm not an international diplomacy wonk, so I can't vouch for the details of the description, but it sounds pretty bad to me. Not that the conference will be all that important, mind you: the antisemites will celebrate, the others will avert their eyes, and the world will continue as before. Irwin Cotler, one of the more knowledgeable experts on human rights anywhere, has published a long but worthy article about the new form of antisemitism: denial of the Jew's right to have a nation state. The term Judenstaatrein seems to have been coined by Per Ahlmark, a former Swedish Deputy Prime Minister. I'd have preferred the article to have been published in the NYT to the Jerusalem Post, which has a smaller and less influential readership, and also tends to hide articles after a few days, but I wasn't asked. Cotler's article follows a meeting of the Interparliamentary Coalition for Combating Anti-Semitism (ICCA), a new organization which just had its first meeting in London. So far as I can tell from the Guardian search engine, they had one single article on the conference (did I mention it was in London, and was addressed by Gordon Brown? ); it's an article by one Antony Lerman, and on its own offers a legitimate tone of caution of getting carried away when discussing antisemitism. Had his been one of three viewpoints, say, it wold have been fine. But it wasn't. I'm gonna be real careful today and not get anyone too angry with me. But couldn't some aspects of anti-semitism be caused by the part of the torah that says the Jews are gods chosen people, therefore making everyone else second class citizens? Doesn't racism breed racism? I've never blogged about the Guantanamo detention camp. It's not my topic, not something I know much about, and believe it or not, it's not even a matter I have much of an opinion on one way or the other. For many millions of people however, many of them with no more information or connection than mine, it was an article of faith, yea, even a central dogma, that Gitmo is a Very Very Bad Thing, and a Colossal Crime of the Bush Administration. Of course, the guardians of the dogmas aren't going to take any of this lying down. True, they have yet to read the report, but they don't need to, since dogmas and articles of faith by definition are impervious to factual investigation; they function in other spheres. Gitanjali Gutierrez, a lawyer for Guantánamo detainees at the Center for Constitutional Rights, said that she and other lawyers found that conditions have remained bleak since the start of the new administration. Ms. Gutierrez said that a report by the rights center, to be released next week, asserts that two major Guantánamo prison buildings, known as Camp 5 and Camp 6, should be closed immediately. She said prisoners there continue to be held in isolation for as long as 24 hours a day, that psychological difficulties are treated as disciplinary infractions, and that many cells are windowless. One reason I'm a historian by preference, even while presently trying to make a living as something else, is that history is so perpetually interesting. Look where we are right now, for example. Twenty years after Francis Fukuyama rather prematurely declared that rational thought and liberal democracy had ended history, we've got a virulent strand of Islam warring with mankind, a resurgent Czarist Russia, a non-democratic China just beginning to flex its muscles on the international scene in blithe disregard of the the entire political agenda of humanism, and significant sections of the liberal West, the parts that regard themselves as its elite, are abandoning their glorious but hard-fought for heritage in favor of a set of religious-beliefs-sans-God that takes the silliest part of religion and the silliest part of secularism while abandoning all the serious parts of both. What's to be bored by? Labels: American Politics, International Law, Rational Discourse? Regular readers of Ruminations will be aware that one of my main themes is the attempt to figure out what makes Israel's harsher critics tick. Yet I do make a distinction between individuals with blogs, and establishments such as The Guardian, which has been around for generations, has some 700,00 subscribers and a larger number of readers, and can plausibly be seen as representing a segment of society. The individual bloggers may reflect corners of society, but I don't think they're as significant for outlining social or historical trends. Or better, they are, perhaps, in the aggregate, but not individually. Which means I've got to look at a diversity of them. So, here's hoping, Insha'allah, that I have the character not to waste any more time on Juan Cole, about whom I've satisfied myself that he's an ideologically-driven misrepresenter of facts and an embarrassment to rational intellectual inquiry, in addition to offering a haven to antisemties in his moderated comments section. Previously to him I had looked at others and then moved on; it's time to move on from him also. A possible new candidate is Glenn Greenwald, who blogs at Salon. His present post is shrill and repugnant, but perhaps he had a bad day and got carried away, something that can happen to anyone; even I've had such days. Greenwald is a lawyer and author; I don't think I've focused on any lawyers so far. He's noticeably Jewish, by name, picture and content; I don't remember having focused much on anti-Israeli Jews so far, assuming that's what he is. Or isn't: let's follow him for a while. The Gemara in Bava Batra, 121a, wonders why the 15 day of Av is a day of celebration, since it's not written in the Bible. A list of answers are given, one being that at the end of the war between the tribe of Benjamin and all the others (Judges 25) a vow was made never to intermarry with the sons of Benjamin; a later generation decreed, on the 15th of Av, that the vow had been for that generation, not all generations, and it was time to bury the hatchet. The day the Israelites accepted the warning of ten of twelve scouts newly back for the Promised Land, whereby the Canaanites were too strong to be overcome, was the 9th of Av. Faced with this rebellion, God decreed that the 9th of Av would henceforth be a day of mourning; He also decreed that the people would wander an extra 38 years in the desert, and that none of the adults of the time would live to enter the Promised Land except Joshua and Kaleb, the two loyal scouts of the twelve. Every year thereafter, on the night of the 9th of Av, all the adults would dig graves and sleep in them. The next morning a voice would call for them to rise, but a portion of them wouldn't - a 40th (actually, it should have been a 38th) would have died. On the 40th year, as preparations were being made to enter the Promised Land, the adults dug their graves and laid down in them; in the morning they were all still alive. Fearing they had miscalculated the date, they lay in their graves the next night, and the next, and the nex; each morning everyone was still alive. On the 15th there was a full moon (the Jewish calender is lunar), so clearly they hadn't miscalculated, and the 9th had passed without mass death. The curse had ended,and the 15th became a day of rejoicing. This thread began, and is explained, here. Though it occurs to me to add another bit of explanation. In a way, one can say that the Jews as a group are the sum of their communal memories. Faced by thoughtless, ignorant but malicious types such as Caryl Churchill and the many millions of her fellow angry fools, these occasional Daf Yomi posts are meant to give glimpses into the richness and complexity of Jewish culture and memory. Will be, of course, Netanyahu. Though it will take a while. Until then, I'm mostly not commenting on the process of constructing (or de-constructing?) our next government. Half of what you read or hear about the process is spin, half is trial balloons, half is negotiating ploys, half is bad faith and the final half is people talking through their hats. So there's no point in trying to comment on any of it. What is clear is that there are only two possibilities. The positive one is that three of the four larger parties will set up a governing coaltion that will be stable, possibly efficient, and could serve us well. I think that's what the voters wanted in the first place: a large centrist coalition, perhaps right-leaning but not fatally so. (Of course that's what I'd say, what with being a centrist myself: but I do think that's what the numbers say). The negative possibility is that we end up with a narrow majority of everyone on the right, many of whom are incompatible with each other, where the agendas of the far right will dictate all sorts of foolishness, we'll be treated to to a year or two of high political drama, and the next elections will be in 2010. There's all sorts of talk swirling around cyberspace about an Israeli spoof someone put up on Youtube, where a section from a recent German film about Hitler's final days has been dubbed with Hebrew subtitles, according to which Hitler can't find parking in Tel Aviv. (I never drive down to Tel Aviv. I take the bus and let the bus driver worry about parking). Haaretz tells that Holocaust survivors are furious and demanding Youtube delete the clip. Noah Flug, the chairman of the Center of Organizations of Holocaust Survivors and a survivor of Mauthausen concentration camp, sent a letter to YouTube demanding that the clip be removed due to its sensitivity. I've known Noah Flug for more than 40 years, and have great respect for him, but in this case I disagree. The clip isn't offending to survivors, it's side-splitting funny, at least in its original Hebrew version. The English one that has been put up "in response to public demand", so to speak, is merely quite funny. Both of them are embedded in that Haaretz link, so go judge for yourselves. Outgoing Israeli Prime Minister Ehud Olmert has ruled out allowing needed goods into Gaza, which Israel has virtually surrounded from land and sea, until Hamas releases captured Israeli soldier Sgt. Gilad Shalit. Olmert is thereby committing a war crime. You can't collectively punish the general Gaza population if you are the occupying authority. It is not allowed to torture that wailing child in the video above by keeping out painkillers, just because some adult somewhere from the same territory captured an Israeli soldier. But Olmert will get a pass on his war crimes. Apparently you only get punished for them if you are weak or lose; it isn't the crime but the power of the criminal that matters. The Palestinian UN observer, Riyad Mansour, stressed the importance of achieving a long-lasting cease-fire so that Israel does not go and attack our people as they want but said Shalit's release should not be linked to the opening of border crossings. "These are two separate issues," he told reporters. "To connect them in this manner, it means that the Israeli government is not interested in a long-lasting cease-fire now, and not interested in opening the crossings and lifting the siege." Serry told council members that a durable cease-fire can only be achieved if there is broad progress including an exchange of Palestinian prisoners for Shalit, who was captured in a 2006 cross-border raid, action to prevent the smuggling of weapons into Gaza, the opening of borders, and unity among rival Palestinian factions. These steps, he said, would also pave the way for the longer term recovery and reconstruction of Gaza. "I emphasize these points...because one month since unilateral cease-fires were declared, a proper cease-fire is still not in place, and there is an ever present danger of a return to the unsustainable conditions of last year, or even for renewed and more devastating violence," Serry warned. Shalit's release, the UN's special coordinator for the Middle East peace process said, "If you want to improve the situation in Gaza, you have to look at the other issues as well, and Shalit is a very important one." So, on one side we've got Cole and the Palestinians, while on the other side we've got an important UN fellow and Israel. How very peculiar. which, you'll just have to pardon me for saying, is really funny. Someday, as I've already say, I ought to write a book titled "How to Tell an Antisemite" (meaning how to recognize one, and how to tell it, gently, that that's what it is, without hurting its feelings). At the moment my excuse not to is that I have to make a living. However, if anyone would like to support me for, say, a year or so, then my excuse might have to be that I'm probably not enough of a masochist to immerse fully in this filth. Still, if it's in a good cause... Nah. A futile cause. But won't the continued expansion of settlements make an agreement more difficult to reach no matter who is in charge of negotiations? The pithy answer is No, of course it won't, in spite of the unanimity of the world media, from the antisemites to the ignorant, all agreeing that it will. A fuller answer goes something like this. Continued expansion of settlements might tells us that the Israelis have no intention to allow partition; or that they won't be able to; or that the Palestinians who otherwise want partition will be so discouraged they'll drop the idea and prefer more violence. None of these assertions is particularly reasonable, and none bears factual scrutiny. 1. Israeli intentions. A majority of Israelis supports partition of this tiny little place so as to achieve peace alongside the Palestinians. I'm not going to go into the full demonstration of this (I have done so already both on this blog and in my relevant book); suffice to state that even in the incoming Knesset, which if you believe the pundits is really really right-wing, there are easily 80 MKs of 120 who are in favour of partition; the number that will go along with it were it to happen in a constructive framework is even higher. The settlements play no role in this discussion, since we all know that most of them will be disbanded, and a few of them won't. Yossie Beilin says there will be swaps of good agricultural land for settlements; Lieberman says there will be swaps of Israeli-Arab towns for settlements, but most everyone accepts the premise of partition. Why, you'll ask, if most everyone knows the settlements will be disbanded, are a few of them still growing? Most of the growth is in the few, large ones, that won't be disbanded. As for the rest: indeed, enlarging settlements everyone knows are destined to be disbanded is idiotic. But no more so than artificially holding down the price of water for farmers in the worst drought year in memory, which is also happening, or supporting hundreds of thousands of Haredi families in which capable adults don't work because of a warped ideology. Some folks figure out how to manipulate the system for their benefit, no matter what the majority wishes. Show me a country where this isn't true. 2. Israel won't be able to disband the settlements even if a majority wishes to do so and has reached an agreement with the Palestinians. So far, this proposition has been tested two and a half times. In 1982 the settlements in the Sinai were disbanded with the support of 117 members of the Knesset. In 2005 the settlements in Gaza were disbanded with the support of a rather narrow majority in the Knesset. In 2000 Barak offered to dismantle most of the settlements, there were no significant protests in Israel, but the idea was then foiled by the Palestinians for reasons of their own. Had they not foiled it, the sovereign state of Palestine would be preparing next year to celebrate its first decade of independence and ethnic cleansing of Jews. When people tell that soon there will be so many settlements they won't be removable, ask them how they know, if there are any facts to support their thesis, or if they're simply talking. 3. The Palestinians are so discouraged by the Israeli settlements they've given up on peace. This statement is repeated again and again, but contravenes the facts. The violence of the second intifada began only after the Israelis agreed to dismantle most settlements. Then, in 2005 Israel disbanded the settlements in Gaza, and ever since the violence has been getting worse. I suppose if one wishes still to believe the war is about settlements one can do so, but only at the price of suspending rational thought. Bradley Burston cites Elah Alkelai convincingly, to my mind, to explain that the voters didn't vote to block an agreement with the Palestinians but rather the opposite: they voted to ensure their representatives at the negotiating table were tough bastards in the best meaning of the term. Think of it as severance of an arranged marriage, and the vote Israelis cast last week was for what they perceive as the roughest, toughest divorce lawyer in town. Had I thought Netanyahu would drive the hardest bargain, I'd have voted for him, too; the reason I didn't is because past experience indicates he's actually a poor negotiator, who loses control and capitulates the moment the going gets hard. Olmert was vastly his superior in that respect, but alas, Olmert allowed himself to be ousted for corruption. The other day I had a meeting in a part of town I don't pass through on a regular basis. While passing through this time, I saw a campaign poster (actually two torn ones side by side) geared for voters who care not one bit about the issues you were led to understand were the ones they were supposed to be interested in. So here's a picture, then a translation, then a de-coding. Ah, and the letter gimal is crossed out from the word biglalo, because of him. So far the translation. Any readers of the NYT, say, or any other media outlet, who might have any idea what this is all about? No? It's actually rather simple. Litzman is representative of the Gur hassids in the Aguda party which runs under some other name. Voters in Israeli elections cast a vote with a slip of paper with a letter, a throwback to the early 1950s when not everyone could be expected to read long names in Hebrew (or Arabic, for that matter); Aguda's letter is Gimal. 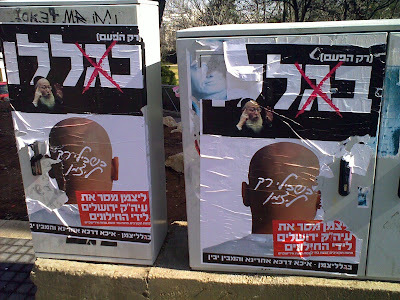 Back in November the Gur people refused to vote for the candidate of the Aguda in the Jerusalm municipal elections, thus contributing to the victory of the secular Nir Barkat, may the Lord protect us, especially as secular folks are hardly to be distinguished from skinheads. I don't know what place Litzman was on the Aguda list last week, but apparently some Haredi folks are so angry with him for reducing the municipal pork (I really do apologize for the word, but that's how you say it in English) that they're willing to vote elsewhere. But not any old "elsewhere", of course. Which is why that last sentence in Aramaic tells them where to go: to Shas, of course. But only this once, of course, as the top sentence says. By next time we'll have gotten rid of Litzman and Barkat and Shas. And the skinheads too, god willing. Did any of this make any difference? I doubt it. United Torah List (Aguda) got 5 MKs, Shas got 11, neither of them doing better than last time - actually, a bit worse. But as folklore goes, it's cute, isn't it? A military source involved in the investigation told Haaretz, "It's clear to us that in a small portion of the combat sectors immeasurable damage was caused, and that is very difficult to justify from a legal perspective, particularly if such justifications are called for in legal proceedings with international organizations." Call me hard-hearted callous evil and mean, but I'm not overly perturbed by this. Lost human lives are lost forever; buildings can be rebuilt. That's what Iranian funds are for, not to mention the PA being one of the top recipients of international aid worldwide. After Israel left Gaza in 2005 the Palestinians held democratic elections and a majority chose Hamas, a stridently antisemitic party that proudly calls for the anihilation of Israel; its men then shot thousands of rockets and mortars at Israeli civilians from among the populace. The citizens of Gaza never voiced any noticeable objections. Whenever the Palestinians decide they'd like to live normal peaceful lives alongside us, we will reciprocate. If they prefer war, we can supply that, too. Though unlike them, we will try not to kill their civilians, and we'll painstakingly and meticulously publish the results of our post-war investigations. NATO, the British and the Americans don't investigate and publish, nor does anyone expect them to. As for the Russians, the Sri Lankens, the Ugandans, the Thais, the Rwandans, the Congolese, the Sudanians - to give a partial list of countries which killed larger numbers of civilians than the Israelis in 2008 - most people can't even say anything about them at all. Remember the tremendous international glee late in 2007, when a muddled NIE report sort of said the Iranians had halted their nuclear program or perhaps not but then again who knows? At the time I took the highly unusual step of reading the document, and was surprised (or actually, not) to find that about 98% of the reportage was wrong. Well, it now appears that the report was wrong. Or rather, since it didn't actually say anything, and thus couldn't be wrong, it was misleading. Is the media world reporting on this change of mind (which is coming, I remind you, from the Obama administration, not the Likud)? Well, to be honest, now that you ask, umm, you know, I mean, hmmn... no, not really. I saw mention of it at the Jerusalem Post but decided they weren't a good enough source for what the American administration thinks. Soccerdad has pointed me to the LA Times, not one of my regular haunts, but since it's an important American paper I'm linking to them. As for the question, where is everyone else? I have no idea. Who Was Killed in Gaza? Haaretz cites an IDF report listing 1,134 Palestinian fatalities in the recent Gaza operation, 673 of whom were from Hamas or other fighting formations, 288 were non-combatants, and the rest have not yet been identified. Apparently the IDF is making lists by name, so as to know in each case who the dead person was. My understanding is that the investigation is not yet complete. Israel is 20% Arab, which should yield 24 seats in the Knesset, but only 9 were apparently elected, down from 12. Attempts were made to disqualify some Arab parties from running, but the Supreme Court struck them down. By the way, the reality is even further from Cole's thesis. Something like one of the eight percent of votes garnered by the Arab parties came from the far-left Jews who voted for Hadash, a sort of communist party which has one Jewish MP on its list to prove its cross-national solidarity, and indeed he attracts cross-ethnic votes. Which means that at the very most 40% of the Arabs voted for Arab parties. The proportion of abstainers was a bit higher among the Arabs, but even so it looks like a majority of the Arabs voted for regular Zionist parties; they didn't even converge on the Left-wing Meretz party, which almost disappeared for lack of votes across the board. In the past, when the Haredi Shas party used to control the Ministry of the Interior and its control of funds for the municipalities, one of their MKs was voted in by Arabs, but that wasn't the case this time. Looks like the Arabs voted for Labor, Kadima, Likud.... Lieberman? Whether any of this is serious I can't say; it supplied the ten or twelve of us in the morning study group lots of giggles; the best part was when the speculation went so far as to postulate a hen attacking a rooster before laying an egg - though even the Gemara found that fanciful. And how is all this relevant to Israel's elections, I hear you asking? Because Israeli Jews have been splitting logic like this for thousands of years, and you see it in their electoral patterns. First, in the fact that in any given election there are about 30 parties, ten to 15 of which can be expected to make it into the Knesset (apparently 12 this time). More significantly, you see it in their elaborate schemes of what's called tactical voting, which is when you vote for the wrong party in order to reach some secondary goal. An example: let's say I wished Netanyahu to be prime minister, but was reassured by the polls that he probably had it sowed up already; I intensely dislike his ultra-orthodox partners, however. If I vote Likud, there will be a Likud-Haredi coalition whose foreign policy I will like but whose economic policies I won't like. Solution: vote Lieberman. He'll go with Netanyahu but he hates the Haredi and will protect us from them. Of course, I can't do that if I'm also pro-settlements, because Lieberman is willing to have many settlements disbanded so as to hand them over to the Palestinians along with the Israeli Arabs along the Green line, but that's what elections are about: you've got to make a decision, and you can't have everything, not even by voting tactically. Another example: I want Livni to be prime minister but the polls indicate she won't. I assume Netanyahu won't want a coalition with all the folks on his side, because too many of them are crazies even by his standards and he'll want to be invited to the White House, so now I have to figure out who is more likely to be the center-left party he recruits, and vote for them. Kadima or Labor: which will he choose, and how can my vote effect his choice? Or perhaps it's the other way around: While I'd gladly vote for Livni, I'm afraid she might join Netanyahu so I must vote for Meretz to assure my vote doesn't support Netanyahu in any way possible? All you folks with only two parties don't have the faintest idea how complicated this democracy thing can be. Which is why I personally have never voted tactically. I figure out which person I'd most like to have as prime minister, and I vote for his or her party. What a quaint idea, don't you think? Some sort of analysis of the election results is called for, but - besides my need to get other things done, thus crimping my blogging time - I'm mostly scratching my head today. The broad outcome was predictable and predicted, of course, but there are all sorts of questions that cry out to be answered. Why does Kadima trounce Labor? Why was Meretz hit that bad? Why did Likud surge back - and why didn't it? What does the Israeli voter want, and why not? I pride myself on being an adept though fallible long-time observer of the Israeli scene, but I admit no obvious answers spring to mind. I'll be going offline in a moment: we have this custom of spending election night with relatives, in a convocation where the number of parties voted for is hardly smaller than the number of eligible voters: we eat popcorn and disagree about what the results might possibly mean, and agree to reconvene next time which is never far ahead. As the number of our voting children grows, the spread of parties seems also to grow. I have been voting since 1977, and have switched party allegiances at least three times myself. Being a centrist means you've got to keep on your toes, and abandon whomever strays too far from the center. Of all the times I've voted, I can't remember an election in which I was so indifferent to the results. Not, as many pundits will tell you, because of disapproval of the politicians on offer - I've been around for a while and have long since lost any illusions I had on that score. My indifference (it's not apathy) stems, I think, from the understanding that it doesn't really make much difference. Peace isn't about to happen. Unilateral disengagement, which I supported a few years ago and support still has been knocked off the agenda by the behaviour of Hamas in Gaza, which took the opportunity to build themselves an emerging state and convince us to give more, and dedicated all their efforts to destruction. Using force will be inevitable and tactically necessary, but it won't solve anything. King Obama the First, aka The Messiah, isn't. I've known for a long time that we're in for the very very long slog; at this particular moment it isn't even clear, however, who can manage it intelligently. I voted for Tzipi, for those of you who asked. But she can't win. And it wouldn't make any difference if she did. Avigdor Lieberman's Yisrael Beiteinu, [is] a far, far-right faction that advocates ethnically cleansing Palestinians. Cole doesn't enable free comments on his blog, only the ones he chooses. However, I've noticed that when I address him as "Prof Cole" and sign off as a Dr, while keeping an even tone, he tends to allow my comments through. So if you go visit him you can also see my rather lengthy take on Lieberman. Top ranking British diplomat Rowan Laxton doesn't like Jews. The Daily Mail said that in response to a query on Monday, Laxton denied that his comments were anti-Semitic, but dodged answering whether they were anti-Israel. The Guardian and BBC websites haven't heard of the case, if you believe their search engines. Michael Totten has put up a long report. Michael is refreshingly not top-notch international media outlet such as the BBC, which is why it's interesting to read his reports. The BBC is one of the world's top media outlets; some would simply say it's the top. It's not some blog some fellow uses to bloviate. It's a serious place. Back when I taught 7th graders, I assure you I would have flunked any student who had written such a description. I'm not talking about adherence to facts, mind you, though one might expect that, too, from a reputable media outlet. I'm talking about simple coherence, such as if Lieberman is or isn't willing to hand over control of territories to Palestinians. Or if he is center, right, far right, or anything else, and what the criteria for the depiction are. Simple things like that: that's all I'd like to have from someone telling me stuff. I spent eight years of my early adulthood teaching high school - long enough to prove I could do it without the students cowing me, a real problem in Israeli schools full of cocky adolescents with zero tolerance for their elders. Actually, once I got the hang of compelling them to listen long enough that they started to learn, I mostly enjoyed it, and in all the years since have never again encountered such a concentration of fine minds as the more unruly 11th or 12th graders I used to confront. So I'm not automatically into educational policies based on what you might call touchy-feely tactics of making the students feel good about themselves and what have you. Find the way to challenge them, and then never stop doing it, if you ask me. Ah, and employ fine teachers, who know their material and know their trade (or art, more likely). Still, Richard E. Nisbett's op-ed column in the NYT explains why with some groups, a little bit of that is exactly what's needed - and not the large expensive and grandiose programs. I think his point is that with some groups, there's a societal handicap that convinces the kids they can't learn and succeed, so they don't; remove that by suggesting it's all about their efforts, not their identity, and they'll flourish. Sounds reasonable to me: set it up so they decide to learn, and they will. While I'm linking to stuff without seriously reading it, Gavin sends us to the Just Journalism report on the Gaza Operation. Just Journalism is an outfit that has taken upon itself the hopeless and thankless task of holding British journalism to its own professional standards on issues of Israel and its neighborhood. I get bellyaches from doing this as a hobby; these folks deserve either a medal or a straitjacket, or both. Anyway, their Gaza report is here; if you ever get up in the morning with a feeling of unwanted elation, this will do the trick to get you back to normal. status-as-refugee-based assistance, should be accelerated. aligned with what should be its ultimate objectives. what most of them so desperately seek: normal lives. An UNRWA spokesman slammed the report, accusing the author of bias and a failure to employ a sufficiently wide range of sources. "The agency is disappointed by the findings of the study, found it to be tendentious and partial, and regrets in particular the narrow range of sources used," Andrew Whitley, director of the UNRWA representative office at UN headquarters in New York, said. "The study ignores the context in which UNRWA operates and the tight line the agency walks due to various pressures," Whitley said. "Someone reading this paper with no background would assume that the Israeli government was a benign actor. No mention is made of the occupation of the West Bank and the Gaza Strip." Here's a proposed translation: Lindsay doesn't realize we're beholden to the Arab version of the story ("various pressures"), and his starting point isn't that Israel is the source of all evil. Sniff. If I ever find the time I'll read and report, but now you know it's there, feel free not to wait for me. Go ahead, by all means. First, there's a difference between having an opinion and publicizing it in a public forum, such as the BBC. The larger the forum, I'd argue, the greater care one ought to take when expressing one's opinion. Yes, I stand by that - and the BBC is one of the most public of forums the world can offer, and it even comes with a mantle of respectability that was acquired, sometimes at great price, over generations. Second, if you read my response, it contained a twist: Not only was I castigating the ignorance of the BBC person, who lacks the qualifications to educate us on her topic; I was also saying that even after I had spent something like 15 years on acquiring the qualifications, some experts still felt I was wrong (and they may have been right). Third, I pointed to the silliness of her methodology: in order to say something about the Israelis, she asked some Palestinians. I was not saying one must have a PhD in order to have an educated opinion, nor that academia is necessarily better at reaching the truth than journalism. Actually, academia is often a poor way - look at Prof. Juan Cole. And journalism can be a very reasonable way for understanding reality - keep in mind the number of times I have praised Avi Issacahroff, a journalist who really knows what he's talking about. That was my point. That some people take the time, acquire the languages, and make the effort - a never-ending one, by the way - to become experts. Other people don't. The first group are worth listening to, whether we like their opinions or not. The second are harmless if they talk to themselves, and an affront to our intelligence if they pontificate from a public stage. To Shaul who reproves me for doing the same, my response is that I try not to. At times I link to things other people write, but as a general rule, I talk about the things I've acquired some expertize about: Jewish things, German things, American things. I'm told the Spanish are virulent antisemites these days: yet I haven't written about this, because I lack the language, the background and the context; so I leave that to others. Nor, to my best recollection, have I written about the Iranians, the Kurds, the Turks, or the Iraqis, even though they all touch upon the story I do tell. The two exceptions are the Palestinians and the Islamists. But even then, I try to be careful. Not knowing Arabic, the most I can say about the Islamists is that according to what I can see and read, they have patterns of cognition and behavior which resemble earlier patterns I actually do know a lot about, as an expert. As for the Palestinians, I really don't know what makes them tick, but unlike the BBC lady, I've been watching them from close up for my entire life, I read lots about them that comes from experts who know more than I, I read translations of things they say - and after all that, I try to limit my statements about them to what I feel competent to say. It's a free world (part of it, though not the Gazan part), and people can say what they will. Even BBC folks can. But by putting themselves in the public square, they also put themselves up to our scrutiny - and to our derision, if justified. Having seen the destruction [in Gaza] and interviewed survivors, she is in little doubt that the Israeli intention was to punish the Gazans for having had the temerity to vote for Hamas. That’s what she’s convinced of, is it? Seems par for the course for the BBC. About when I was finishing my undergraduate studies, when I already knew more about the Holocaust and Nazism than the BBC person probably knows about Israel, I decided the time had come to figure out for myself what the Nazis had thought they were doing. So I moved to Vienna and learned German, and then moved back and spent more than a decade reading tens of thousands of pages of Nazi documentation and many thousands of pages of historical research about them, and then I wrote that doctorate we alluded to; it was only at that stage that I felt confident in speculating about what the Nazis intentions had been. Once the book was published, some experts agreed with me, and others didn’t, and they were all knowledgeable about the topic. It would seem to me that if the BBC correspondent wanted to speculate about Israeli intentions, the least she could do would be learn Hebrew and spend some time figuring out how Israelis understand the world; interviewing Palestinians seems to a peculiar method of comprehending Israeli intentions, don’t you think?